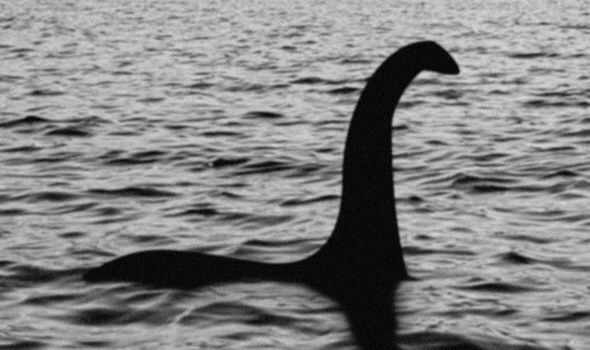 We’ve had alligator sightings in our fair city and now there is a Loch Ness Monster sighting tonight. The alligator sighting took place last May. A truck driver saw an alligator under a bridge and stopped to take a photo of it. You have to realize we live in suburbia 30 congested minutes south of Atlanta so seeing this very large and ominous creature was HIGHLY unusual. The truck driver alerted the news and Flat Creek Floyd, as the alligator was soon named for the creek he was found in, became a celebrity. Super stupid people then began traversing the creek to try to take selfies with the alligator. The city hired a gator catcher but so far, no luck. Then today, there was another sighting… or maybe it was just a log. No one was sure. The news trucks came out again and this time found a young mom with her two kids to interview. All three were playing near the edge of the water and saying how scary it was that there might be an alligator here. Here’s my advice: GO HOME LADY!!! I beg of you to use some common sense and caution. Get your children out of jaw’s reach of this alligator. I realize it may be a log but who wants to be the one to figure it out? I guess I like my hands and children too much to throw caution to the wind and frolic at the edge of the alleged alligator pond. However, I will take my chances with my new Loch Ness Monster. I bought myself a going back to school gift and it came yesterday. I saw this online and had to have it. 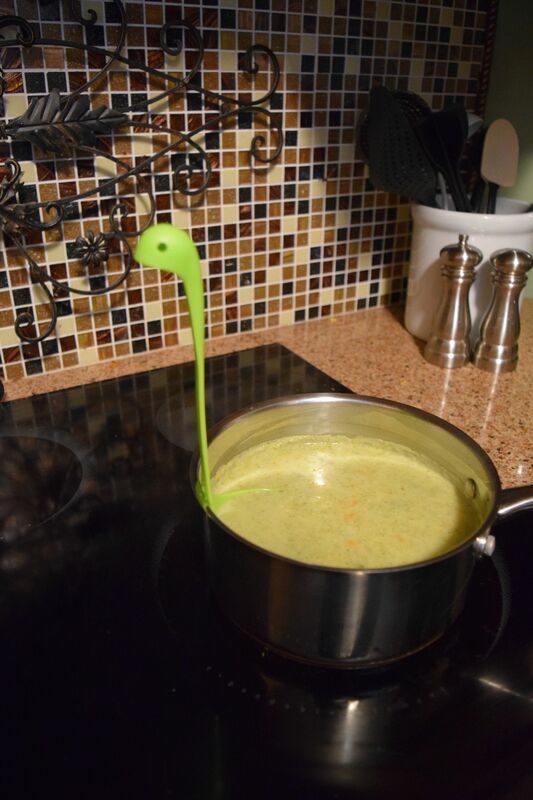 It is a soup ladle of the Loch Ness Monster. Toooo cute! Here he is gliding out of my broccoli soup tonight. No recipe for the soup because I dumped the ingredients together: broccoli, carrots, potatoes, onions, water, milk, salt, and pepper. Blend half in a blender; add a little cornstarch and toss in a little cheese for garnish. Serve with a monster. Westside girls lunch, Saturday August 20th, 11:30, Olive Garden, Arbor Place, Douglasville. Please let Terri and Kristen know too or send me their emails….hope to see you there!! Love this blog…would you believe that last month we actually had a real live alligator in our front yard…and your soup ladle is just too cool…where did you find it? I got my soup ladle from a site called Pick Your Plum. It offers daily bargains like the site Brad’s Deals and others. Consequently the deal is now gone. 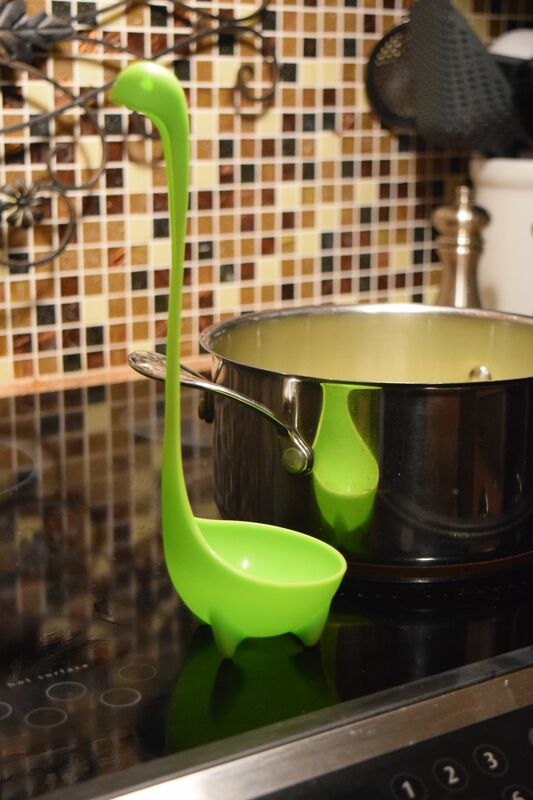 However I did find the ladle for half the price I paid for my “deal” at https://geekyget.com/products/nessie-ladle?utm_medium=cpc&utm_source=googlepla&gclid=CJaI2eP0rM4CFYU2gQodS_0Oog I don’t know if this site is a good one but the price is great. If they don’t have them, I searched for “Nessie Ladle” on Google. There were other places that sold them but they were more expensive. One of your cutest blogs. Thanks! I can’t believe how crazy and risky some people act over this alligator.